McCusker thought he had it made when he took early retirement from the Ulster Police force with a handsome pay-out. That is, until his wife ran off with their nest egg, forcing him back to work as a rent-a-cop. McCusker is not always inclined to pick up his phone at midnight, especially on evenings spent with his new lover; but when the caller is the police superintendent, and the missing person is not only Belfast's foremost public intellectual, but the top-cop's brother-in-law, well... it's a good thing McCusker leaves the ringer on. This, his second outing, takes him from the historic Botanic Gardens, through the ancient Friar's Bush Graveyard to the hallowed halls of learning at Queens University, where he and DI Lily O'Carroll encounter enough scandal and deceit to rival even the most venal of governments. Between a tax-evading pot dealer, a pack of dysfunctional academics, a disinherited older brother, charismatic escorts, and a shadowy American, McCusker and O'Carroll have much to parse as they uncover each subject's truths and motivations. Of course, nobody has a good alibi—and to top it off, McCusker's estranged wife shows up out of the blue. As McCusker and O'Carroll stumble through a hall of mirrors to build a case, they uncover a criminal empire, and the body count rises. "A welcome return for Brendy McCusker... Charles crafts with such a careful eye on the sparks that can fly—some of them charming, some witty, some downright menacing—between characters who don't happen to see eye to eye, or sometimes even to be operating in the same galaxy. Once again, it's hard to resist a hero who realizes, 'He just had a habit of opening his mouth and not knowing what was going to come out." "Charles's skillful depiction of the many sides of love and its strange bypaths lifts this clever novel well above the genre average." "Paul Charles is an outstanding author of crime fiction novels. They are models of character development and powerful observations of people the detectives meet. I enjoy reading his books." "Charles's skilful depiction of the many sides of love and its strange bypaths lifts this clever novel well above the genre average." "Charles has a wealth of experience in the crime genre from his past Kennedy and Starrett novels and the McCusker series delivers the same blend of mystery and engaging protagonists. The characters have an authenticity that Charles has fine-tuned throughout his writing career. Charles ability to weave real-like details helps bring the story full to life. 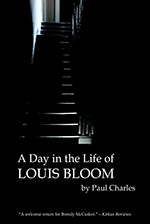 A Day in The Life of Louis Bloom is both a love letter to Belfast and a gripping thriller." "Charles In Full Bloom With Novel... a thrilling page-turner." "Amusing light-hearted entertainment from Paul Charles." In the first of a new series, McCusker, a retired RUC policeman originally stationed in Portrush on the north-west coast of Northern Ireland, returns to work as an agency cop—A Yellow Top—following his wife's flight to America with their nest egg. On his first major case in Belfast he partners with DI Lily O'Carroll to locate the two missing sons of a wealthy business man. But before that case is solved, an American banker working in Belfast is brutally murdered down on leafy Cyprus Avenue and McCusker and O'Carroll are put on the case. While the list of suspects grows even longer, McCusker finds himself juggling his move to Belfast, O'Carroll's frequent blind dates, his status as a hired back rent-a-cop, and being a single man in modern day Belfast and trying really hard not to be distracted by Belfast's beautiful women—one mysterious one in particular. There is no relief when McCusker and O'Carroll eventually find a suspect only to discover the suspect in question has a water-tight alibi. Only one of the detectives believes the alibi is genuine. "Readers will definitely want to see more of Brendy McCusker." "[A] twist-filled tale of betrayal and revenge." "The author has not only created a wonderful character in McCusker, but also a top-notch story. 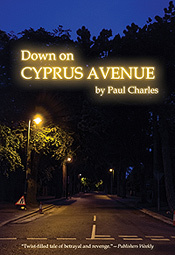 Down on Cyprus Street has plot twists and turns that make it a heckuva good read. Just when the reader, along with the detectives, believes the right person is in custody, a new set of clues emerge pointing to someone else. Good writing. McCusker truly carries this mystery. He is a street cop doing what he loves to do, and it shows. At the end of the book, even his partner praises him. "In the short time I've known him," Lily O'Carroll says, "I've come to realize he's more preoccupied in protecting the innocent than he is in punishing the guilty." Readers will surely want more of this interesting detective."